Public comment helps the Supreme Court of California’s Committee on Judicial Ethics Opinions draft advisory opinions on ethics issues of importance to California’s judges—it also helps them decide whether to publish an opinion or redraft based on the comments received. 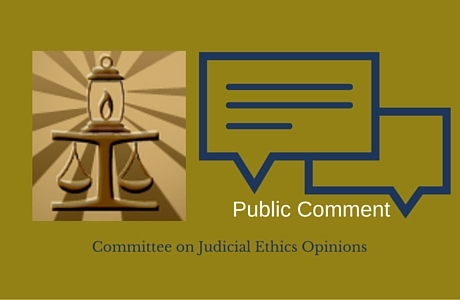 The Supreme Court’s committee is the only judicial ethics advisory committee that uses the public comment process for formal opinions anywhere in the United States. The public has already had the opportunity to comment on draft opinions dealing with issues ranging from political fundraising to the acceptance of gifts by judicial officers. The committee is currently seeking public comment on a draft advisory opinion relating to judges meeting with vendors—how judicial officers may ethically meet with private vendors who provide goods or services to courts or parties under court order. Asking the public to comment on our draft opinions is an important part of our work. Receiving comments from judges and the public allows us to reexamine our thinking and look at the practical effects of the advice we give. To date, the committee has published eight formal opinions, all of which have received public comments that have ranged from being supportive to raising concerns about a draft opinion. Nevertheless, they always add perspectives and insights that assist the committee in finalizing the reasoning for a draft opinion and the decision to publish or not. The committee has received up to 33 individual comments on an advisory opinion and at least 6 on every opinion it has issued for public comment. Many have included detailed and in-depth reviews of the draft—the longest comment received was a 26-page commentary—all have been informative. All comments submitted to the committee are confidential and will not be disclosed—unless the commenter waives confidentiality. Comments are reviewed and carefully considered by the committee, and if confidentiality is waived, are published on the committee’s website for public review after the comment period closes.